At the beginning of Henry VI, Part 1, King Henry V's funeral is taking place, and messengers arrive with news of trouble in France. The noblemen rise up and plan tasks to reclaim their land from the French. The new king, who is Henry V's son, gets ready to do work to remedy the situation in France. Meanwhile, Gloucester gets into a fight with the leader of the church. In France, a English hero named Talbot has been taken prisoner. Talbot gets released in exchange for a French lord. Talbot and Joan end up fighting. 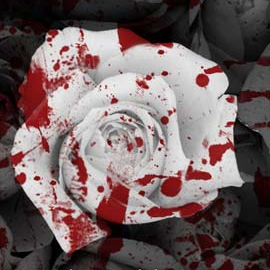 Also in this play, different parts of England are fighting one another - The Red Rose vs the White Rose. Towards the end of the play, Suffolk seizes a young French princess, Margaret of Anjou, with the intention for her to marry King Henry VI. Suffolk hopes that once he gets Margaret married, it will give him the power to control the new king, through his control of her.